LATE King Immanuel Kauluma Elifas of Ondonga was a covert Swapo operative during the armed liberation struggle. Since his death on 26 March, he was described in various messages of condolences as an uncompromising freedom fighter, but the details about the exact role he played during the war of national liberation only emerged Friday when the former commander-in-chief of the People’s Liberation Army of Namibia (PLAN) and Namibia’s founding president Sam Nujoma took the floor during the memorial service at the Onamungundo palace. 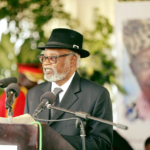 Nujoma unveiled the little known clandestine role played by King Elifas and described him as a brave revolutionary leader. According to Nujoma, Elifas was one of very few traditional leaders who during the liberation struggle refused to have their residences transformed into a de facto military base. The then South West Africa Police (SWAPOL) provided “home guards” to “sympathetic” traditional leaders to protect them against possible attacks by Swapo guerrillas. As an additional defensive mechanism, their residences in rural villages were surrounded by a sand dyke, but king Elifas rejected the idea. Nujoma who met late Elifas in London in 1985, pointed out that the late king provided covert support to PLAN combatants, providing them with alibi as “palace orderlies” a function they appeared to perform only during the day, but they became guerrillas at night. And whenever some of them were captured by the security forces King Elifas secured their immediately release arguing that they were not “terrorists” as alleged but were his “palace orderlies”. Elifas also provided Swapo with confidential information using one of his trusted senior headmen as a courier. The information was relayed through a PLAN detachment known as “the Ground forces” in the north-west front. With the repatriation of thousands of Namibians under the United Nations Security Council Resolution 435 in 1989, king Elifas welcomed the exiles by providing a vast area for their resettlement. The area near Oshivello is now known as the King Kauluma village. King Elifas ascended to the throne in 1975 after his elder brother Fillemon Shuumbwa Elifas – who was considered by Swapo as a “puppet” – was killed by an unknown assassin. Nujoma’s revelation comes more than ten years after similar revelations were made during the funeral of late bishop James Kauluma of the Anglican church at the Ongula Ya Netanga village where retired Lutheran bishop Kleopas Dumeni revealed how he and late bishop Kauluma used their top church positions to spy for Swapo. Dumeni was based at Oniipa near Ondangwa and was code-named “Haihambo of the north”, secretly gathered the information in the north and relayed it to Kauluma who was based in Windhoek and was code-named “Haihambo of the city”, who in turn relayed the information to Shapwa Kaukungwa, Swapo’s representative in Western Europe. When the two bishops travelled to Europe, Swapo provided them with forged travel documents that enabled them to visit Angola as “members of Swapo’s central committee”.